The Norfolk Broads are largely synonymous with Norfolk. Covering an area of over 100 square miles, the waterways and lakes that form the Broads make it Britain’s largest protected wetland, home to a wealth of birdlife. The area is managed by the Broads Authority and holds the equivalent status to a National Park. The Broads Authority is responsible for conservation, promoting leisure activities and the management of waterways for navigation. As a result of this third mandate it was defined under a different act of Parliament when it was formed 25 years ago. On January 23rd 2015 in a landmark vote the Broads Authority voted with an overwhelming majority to brand the area the Broads National Park to better help promote the area. The landscape is largely man made; the lagoons are flooded Medieval peat extraction pits. Evidence of more recent intervention is also clear, with dykes and windpumps to manage water levels. The adjacent villages Wroxham and Hoveton lay claim to the title “Capital of the Broads” and are a good starting point for boating excursions. Both villages are served by Wroxham Station on the Bittern Line so there is a regular and direct public train service from Sheringham and Norwich. It is impossible to miss “Roys of Wroxham”. The department store claims to be the “World’s Largest Village Store” and was founded by the Roys brothers in 1895 and has remained in family hands since. 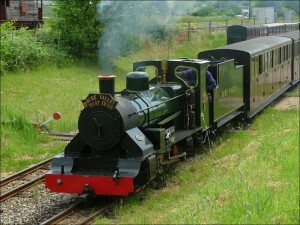 The Bure Valley Railway runs a timetabled service from Aylsham, though the service only runs at weekends out of season. The railway operates steam and diesel locomotives and with 18 miles of track claims to be the longest 15″ gauge railway in Norfolk. For the more energetic there is a cycle & footpath constructed alongside the entire 9 mile length of the railway. Cycles can be carried aboard scheduled services for a small charge, subject to space, for the return journey. Horsey Windpump, near Great Yarmouth, is a 5-storey draining windpump managed by the National Trust which offers stunning views of the coast and broads alike. The nearby beach, Horsey Dunes, is a major wildlife site, home to the only community of seals living in the Broads. 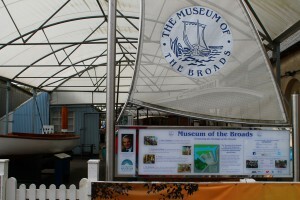 The Museum of the Broads is a family friendly activity that is a great starting point for your adventure on the Broads. There are activities for children and a café and gift shop, both of which are open free to the public. 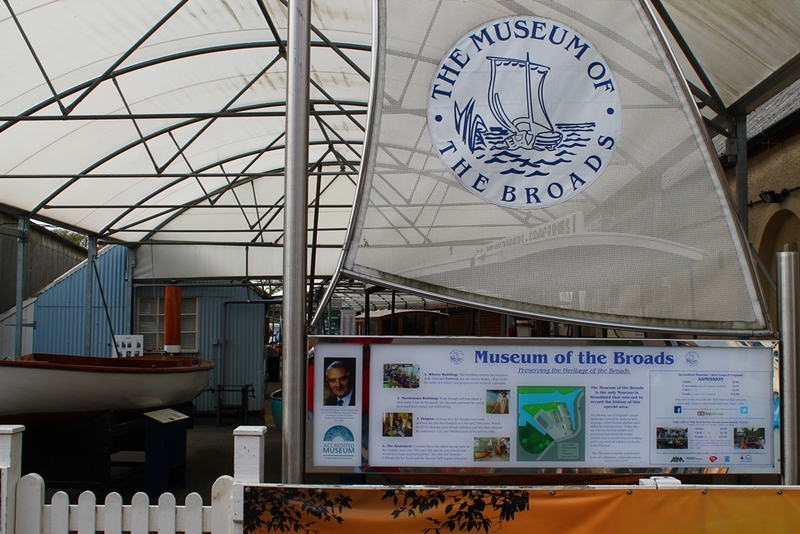 The exhibits are varied, from “Maria”, a racing lateener with a fascinating history to information about the Broads wildlife and man’s place within the environment. The museum offers free electronic talking guides to give us more detailed background on some of the exhibits. For a small extra fee there are river trips in the “Falcon”, a Victorian steam launch along with regular and varied special events. A fun family trail around the Museum with Easter prizes. Take a trip on the steam boat, Falcon, Tue to Thu. Museum opening times: Sun to Fri 10am to 4.30pm. Closed Sat. Children: £2.50 (5-18 yrs). Under 5s free. The eighth Broads Outdoors Festival has scores of activities to help you enjoy all that is special about Britain's Magical Waterland. Find your perfect pastime - canoe trails, guided walks, sailing on a traditional Norfolk Wherry, riding a narrow gauge train or visiting historic buildings. Sample different local beers whilst enjoying Reverie Jazz Trio's gypsy swing. Take a trip on the river on our steam boat, Falcon. Bring chairs, rugs and your friends! Our Beer Tent will feature beers from several local breweries and will be run by Tipples Brewery of Salhouse. Entry: Adult £10, Child (5-18) £3. The Vikings come to Stalham - again! Did you know East Anglia was part of Danelaw in the 9th century? Our family friendly invasion is much more fun! Dress up and enjoy our viking themed activities and makes. A great way to soak up the sun at our waterside Museum. Come aboard our viking steam boat, Falcon, for a unique river trip (£4.00 and £2.50). ​Fun for all the family. Don't miss it!